100% ryegrass. Great wear tolerance and speed of establishment. The varieties used in the mixture are ones that have been trialled by the STRI for use in both winter sports and summer sports situations (Tables S1), making it an excellent all-round performer. The mixture scores 7.26 overall on Table S1. 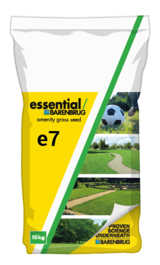 Contains a blend of 100% perennial ryegrass which provides rapid germination as well as superior levels of wear tolerance.